The medical Reserve Corps (MRC) is part of a nationwide initiative to pre-register, manage, and mobilize volunteers to help their communities respond to various events including, mass casualty incidents, emergency medical response, man-made and natural disasters, shelter operations, critical crisis support events etc. MRC units also help to foster disaster preparedness on a local level and serve as Ambassadors to the Office of the United States Surgeon General in the implementation of the Surgeon General’s Health Initiatives such as health education, mass vaccinations. The structure of each MRC unit varies, depending on its own unique requirements and on the needs of the people and community that it serves and will aid the local, existing community emergency medical response systems. Our MRC’s mission statement is supporting and stabilizing communities in crisis using an integrative response. 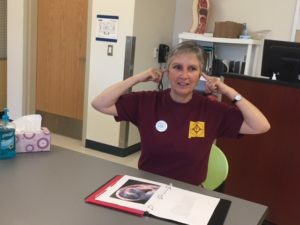 Our NM Integrative Wellness MRC team is a disaster response team comprised of volunteers, including licensed acupuncturists and mental health professionals, along with NM certified acudetox specialists following the 5 point auricular detox protocols. Our mission is to support and stabilize communities in crisis, (evacuees and first responders) using an integrative response, including community acupuncture, psychological first aid, and the 5 point auricular detox protocol for stress mitigation. Our MRC was deployed for the first time after the Aztec school shooting on December 7th, 2017. Eleni Fredlund, Bobbie McKenzie, and two other MRC volunteers, Scott Paterson, CADS and Deb Boehme, DOM, went to the High School and Middle School over a two-week period. 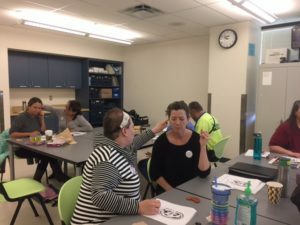 They were joined by three acudetox staff from Navajo Regional Behavioral Health (NRBHC), Albuquerque Public Schools Counselors, and the Crisis Response team. Over the two week period, volunteers documented 1501 ear-seed treatments to students and staff. Students enjoyed the quiet of the acudetox room and did not want to leave even after their ear-seeds were put in. Some were so interested they were taught the Shen Men point and trained as “seed ambassadors.” They bought ear-seeds themselves from Amazon. It was the time that the Star Wars movie ‘The Last Jedi’ came out and because Eleni is a fan, she sent the teenagers out “to go forth and seed the universe!” Approximately 200 students were taught the ear-seeds. They provided an unknown number of additional ear-seed treatments for their families and friends. Choose: NM Integrative Wellness MRC Unit, by checking the check box, then click the select-it button at the bottom of the window. Go to account information and create a user name and password.You will need your drivers license information. Follow the prompts to complete Profile, Identity, Deployment Preference, Contacts, Occupation, Medical History, Licenses etc. You can do each section at your own pace. It takes from 30-45 mins. Having your graduation dates, license numbers, vaccination records would be handy, however, not having them doesn’t interfere with your completing most of it. Initial training for deployment includes Registration; CPR and First Aid; an introduction to the Federal Emergency Management Agency structure and procedures (FEMA IS-100); and Introduction to Acu-wellness in Disaster Settings or Psychological First Aid. We have acupuncture CEUs registered with California for most classes. Many of these trainings are online. We also have other elective trainings on relevant topics. Register on-line for NM Integrative Wellness MRC at https://volunteer.nmmrcserves.org – requirement. Takes 30-45 minutes. See above. After reading the course overview, you will notice on the right hand side there are three highlighted links, which are “take this course”, “course materials”, and “take final exam”. Please note that the IS program requires a FEMA SID to be used instead of your SSN. You can register for one on that link before taking the class. You also have the option of getting a FEMA SID right before sending in your exam. Your choice. We recommend doing it before taking the class. After the required initial training for deployment, try to complete the other FEMA trainings at the rate of one per month. Introduction to Acu-wellness in Disaster Settings. 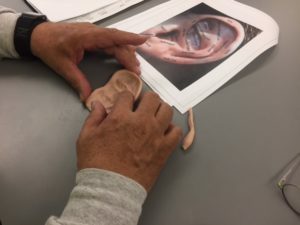 Auricular Acupuncture for Addictions Part 1 and 2. Must attend 2 meetings per year. Meetings are 2 hours and occur quarterly in Bernalillo/Placitas or Santa Fe areas. Must also in two deployments per year one of which can be the NM annual MRC Volunteer Summit (A Sunday in February in Abq). Make up your personal deployment kit and your acudetox jump kit so that you are all ready to go out to help when you are contacted to deploy. CA Education Provider # 810. Refund policy: There is no charge for these courses for MRC members, so there is no refund. The Colorado Acupuncture Medical Reserve Corps has aided communities during fires, floods, and shootings. When the Cold Springs Fire began to torch hundreds of acres near Nederland this past July, one of the medical teams that arrived on the scene didn’t come armed with bandages or painkillers. Instead, its members carried needles. This was the Colorado Acupuncture Medical Reserve Corps, the first statewide, federally funded team of volunteer health professionals dedicated solely to acupuncture. Since January 2014, the group has helped first responders and survivors handle the trauma associated with fires, floods, and shootings through a free five-needle ear treatment that’s designed to coax the nervous system out of flight-or-fight mode. Although the corps has received praise from many grateful patients over the years, all of the feedback has been anecdotal—until this month, when the University of Colorado Boulder releases a study that analyzes whether CAMRC’s technique actually reduces stress. The value of acupuncture as a tool in extreme situations gained wider recognition during the aftermath of 9/11. Lafayette acupuncturist Randi Savage knew of fellow practitioners who were using the five-needle treatment to help New Yorkers cope with the horrific event. When a spate of wildfires sprang up in Colorado in 2012, Savage figured she and other local acupuncturists could put their expertise to use in the same way. The group helped survivors and first responders through other local disasters, too, including the Aurora Theater shooting later that year and the Front Range floods in 2013. To secure funding, Savage registered the organization as a medical reserve corps with the Department of Health and Human Services. Three and a half years later, CAMRC has grown to more than 80 volunteers. Some of the acupuncturists have also joined forces with national and international nonprofits to provide support beyond the Centennial State’s borders, traveling to Nepal after the devastating earthquake there two years ago, and Orlando following the Pulse nightclub shooting this past June. But the acupuncturists’ focus remains on Colorado. They’ve returned to Nederland every few weeks since the Cold Springs Fire to try to help residents sleep. “Getting acupuncture treatments not only helped calm my nervous system but also helped me become aware of how triggered I was on a daily basis,” says Laurelyn Sayah, a firefighter who helped battle the blaze. To test whether their treatments have been effective, some Nederland firefighters—along with police officers and civilians from Brighton, Northglenn, and Boulder—participated in the CU study. They were among a broad cross-section of people suffering from various degrees of stress (including no anxiety at all) who received one, two, or three treatments from CAMRC acupuncturists over a six-week period. Participants took a survey measuring parameters such as their moods and perceived levels of stress, both before and 24 to 48 hours after each acupuncture session. At press time, researchers were still analyzing the data. But with wildfire season already heating up, the corps expects—regardless of the study’s outcome—to be more in demand than ever.